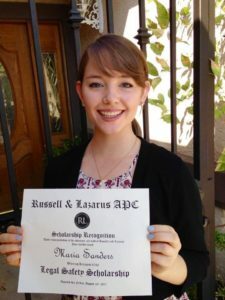 Title the video Russell & Lazarus Safety Scholarship Contest and Include this link https://www.russellandlazarus.com/our-firm/safety-scholarship-for-law-students in the description. We are proud to announce the winners of our 2017 Russell & Lazarus Safety Scholarship! Maria is a current undergraduate student at American River College with a 4.0 GPA, will be transferring to UC Berkeley as a Legal Studies major in January of 2018. 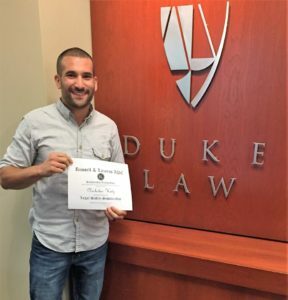 Nicholas is a police officer in New Haven, Connecticut is enrolled at the Duke University School of Law for the Fall of 2017, with an expected graduation date of Spring 2020. He has an undergraduate degree from Vassar College and a Master’s Degree from the University of New Haven. Nick spent the first four years of his career as a patrol officer, six months as a detective in the gang shooting task force, and was recently promoted.